"I was probably ten and it was their last tour. It was in 1966 and they played this huge venue in Seattle. I went with my teenage sisters and every other screaming teenage girl in the area. The band were loud but the fans were louder. It was blood-curdling! I’m not sure if I was screaming. I may have been sobbing . . . "
Backstage in the famous Sadler’s Wells dance venue in the well-appointed London borough of Islington, Mark Morris is recalling the one and only time he ever saw The Beatles in concert. Morris is the jolly, near-legendary head of the world-renowned Mark Morris Dance Group and over fifty years after that first sighting of the Fab Four, he’s bringing his show Pepperland around the world. It is a dance and musical interpretation of The Beatles’ magnum opus Sgt. Pepper’s Lonely Hearts Club Band, and it arrives in Dublin in a few weeks, following an acclaimed international tour. Pepperland is an all-dancing interpretation of the record that captured the spirit of the age but also injects fresh wit and exuberance into some of the best-known songs ever written. It is abstract, it is absurd, playful, and surreal and it certainly fits a lot into its hour-long running time. Morris, a real force of nature, conceived and choreographed Pepperland after an invitation from the City of Liverpool to mark the 50th anniversary of Sgt. Pepper's in 2017. "I don’t have a Beatles shrine and I hadn’t listened to Sgt. Pepper's in decades, why would I?" he says with a shrug. "So when I was asked to do this show, I said let me think about it because I can’t do something I don’t like so I listened to the album again and it was kinda great. It sounded like young people. I loved it! Of course, I’ll do the show! It was the right project at the right time." Along with his regular collaborator, acclaimed jazz musician Ethan Iverson, Morris has re-imagined six key tracks from the album; the title song, With a Little Help From My Friends, A Day in the Life, When I’m Sixty-Four, Within You Without You, and Penny Lane, which doesn’t feature on the record but is certainly of a piece with it. And just like Sgt.Pepper's itself, Pepperland is experimental and freeform. The show actually starts where the album ends with the long decaying note from A Day in The Life, and from there it juxtaposes and cross-pollinates songs with each other. This may sound like blasphemy to some Beatles purists who hold these songs are sacred texts but it’s surely in the spirit of an album that broke rules and defied expectations. Pepperland is abstract, it is absurd, playful, and surreal and it certainly fits a lot into its hour-long running time. Ethan Iverson has form when it comes to deconstructing well-known pop songs, having done alternative versions of many well-known hits with his jazz band The Bad Plus. The studious-looking musician, who has played Ireland several times, says that even thought he was a dedicated jazz fan growing up, he was dragged in by the inescapable gravitational pull of Sgt. Pepper's. "In my formative years I didn’t listen to much rock and pop but I did listen to Sgt. Peppers and it really struck me," he says. "The album is part of my folklore. When Mark asked me to score the show I thought `yeah, this is no problem, I got this. I know this music, it’s going to be easy to bend it to the needs of a Mark Morris dance show'. The ideas came very quickly." Morris himself took a similarly open-ended approach and mixed up vernacular dance from the period such as the Mashed Potato and also jazz age dances like the Charleston, which all feature in the show. Morris is a teddy bear of a man but when it comes to work, he can be a teddy bear with claws. He is a hard taskmaster when he’s working. "Yes. The dancers not like naughty children in any way but I have high standards and expectations," he smiles. "The basic standard is very good work but if it’s super fabulous and I say that, everyone is a little stunned!" 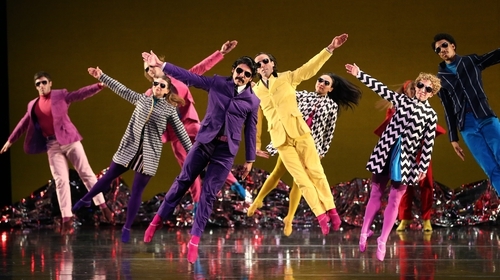 The "basic standard" is, indeed, very good at the Sadler’s Wells production of Pepperland. Members of the company, all kitted out in modish primary colours like they're communing at an imaginary intersection of Carnaby Street and Haight-Ashbury, are introduced on stage as the famous people featured on Peter Blake’s iconic album cover for Sgt. Pepper's. Dancer Minga Prather is Fred Astaire, while her fellow performers represent Sonny Liston, Shirley Temple and Albert Einstein. Composer Karlheinz Stockhausen appears as a female dancer in Day-Glo turquoise and purple. Pepperland even features a nod to Beatlemania, when dancers posing as John, Paul, George and Ringo are chased off stage in an early scene. Later, on a stage bursting with colour and minimalist sets, the dancers’ sunglasses become kaleidoscope eyes. Fab. For the show, Iverson brought together a septet of top musicians to create a chamber music group, including voice (Clinton Curtis), Theremin (Rob Schwimmer), soprano sax (Brian Krock), trombone (Jacob Garchik), keyboard (Colin Fowler) and percussion (Vincent Sperrazza). In Pepperland, A Day in The Life becomes an instrumental, featuring cocktail bar piano tinkling and - cheekily - a Theremin, an instrument that features prominently in the score for the show, but also the very instrument deployed with such mastery by The Beatles great rivals The Beach Boys. A chuckling Iverson seems to get a real kick out of this. "The swinging sixties had a lot of cutting edge electronic instruments, not just the Beach Boys," he says. "The original cast for the pit in Pepperland was musicians I have loved. In the Liverpool commission there was a request for an electronic element so we put in the Theremin, the very first electronic instrument from over 100 years ago." Penny Lane is such a hyperactive blur of vaudeville and avant garde that it’s hard to keep up as characters from the song’s interlocking narrative come to life on stage. "Penny Lane is really fun and it’s one of those things where you know your specific role in the dance so it’s hard to keep track of the big picture but from what I can tell it’s pretty exciting to watch." says Californian dancer Sam Black, who has been a member of the Mark Morris Dance Group since 2007. Even the album’s most maligned song, George Harrison’s Within You Without You, becomes something special in Pepperland. "That is the central movement of the whole piece, it’s in the very middle of the performance so everything radiates out from there." Black says. "There is also a moment in A Day in The Life where we spiral to the ground and sit in this meditative position and gaze down and we just sit and listen to Ethan play piano and it’s kinda close to the end of the evening and we’re tired and it’s actually just a beautiful moment to listen to music." "Sometimes I say Pepperland is like a new stage production of Hamlet or a new retelling of Little Red Riding Hood," Iverson says. "We know this so the point about doing a new version is to find something fresh. If you want a Beatles sing-along, this is probably not the show for you." Pepperland is an impressionistic take on what is already a pretty impressionistic body of work and if you’re looking for a straight Sgt. Peppers narrative, look elsewhere. "You if wanna hear the album, put on the album," says Morris, with another chuckle. "There’s a terribly catchphrase I use - this show is for people who love or hate the Beatles." Pepperland is at Bord Gáis Energy Theatre from April 30 to May 1. Tickets from €15.00 and are on sale now through Ticketmaster.